Larry Morrisey has a way of getting things out of people. They’ll tell him anything. Just ask the families of those he has interviewed over the years, gathering oral histories for the likes of The University of Southern Mississippi and The Library of Congress. “He told you things I never knew”, the children and grandchildren of veterans have said to him. The 44 year-old St. Louis native is an oral historian, recording memories of the past before the memories are lost forever. With a graduate degree in folk studies from Western Kentucky University at Bowling Green, Morrisey’s work is a priceless service to servicemen, especially those who served in World War II. 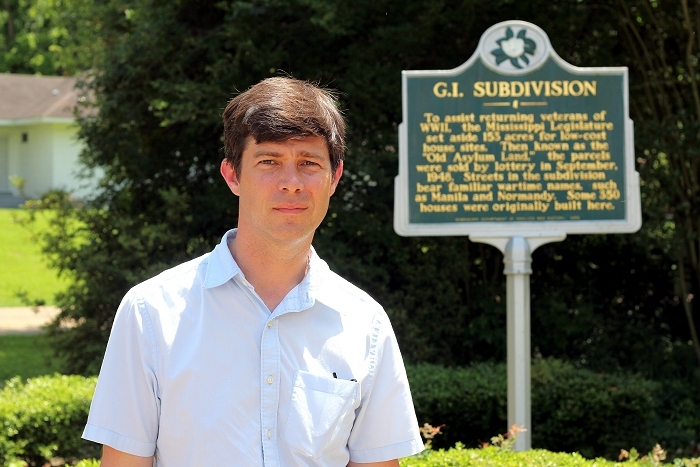 Morrisey was contacted in 2004 to help document the tales of veterans in and around the Broadmoor Neighborhood where a GI subdivision had formed. With a $2,000 Mississippi Humanities Council grant in hand, the common collection of the stories from 12-15 men came pouring out like never before. Getting the stories on tape and on paper was important to Morrisey. “Today, people have an experience like that and they put it on Facebook,” he says. “There’s a more confessional nature to our culture. But back then, everyone tucked it inside.” Now, many of these stories have been captured on tape – audio and video – by family and friends over the years for a The Library of Congress Veterans History project. Morrisey spoke with a man who worked at Los Alamos in New Mexico during the development of the atomic bomb. His neighbor, Cecil Matheny, left school half way through his senior year to fight, saw action in Iwo Jima and returned home wounded – all by the time he was 20. Truman Ellis was a navy veteran who ran the clothing and general store on the U.S.S. Electra. “This was a defining time in their lives,” Morrisey says. Another part of the documentation included hearing stories of how these young veterans came to live in the G.I Subdivision that straddled the Broadmeadow and Broadmoor neighborhoods. The area once known as Tripp’s Crossing was outside the city and was nothing more than a pasture. And it was September 1948 that the Mississippi Senate Chamber of the Capitol in a lottery for a chance to build on some of the state owned land. Larry Morrisey is, by day, the director of grants programs for the Mississippi Arts Commission, a catalyst for the arts in the state. You can also catch him on Sunday afternoons at 3pm on the Mississippi Arts Hour on MPB Radio. He is also a freelance writer who specializes in profiles on music. Larry and his wife Stephanie have lived in Fondren for fifteen years.